The Queen will use her Christmas Day address to highlight the achievements of those who inspire others, from Olympic and Paralympic athletes to "ordinary people doing extraordinary things". During her annual televised message to the nation the Queen will also cite the achievements of the Duke of Edinburgh's Award, which celebrated its 60th anniversary in 2016, and The Prince's Trust, 40 years old this year. Reflecting on the past 12 months, the Queen will say during her Christmas Day broadcast: "I often draw strength from meeting ordinary people doing extraordinary things: volunteers, carers, community organisers and good neighbours; unsung heroes whose quiet dedication makes them special. "They are an inspiration to those who know them." A few days ahead of the broadcast it was announced the Queen would stand down as patron of 25 national organisations, but she remains patron of around 600 others. During her address she will highlight the inspirational work of these charities and bodies. The theme of this year's broadcast is "inspiration" and, speaking about the achievements of the UK's Olympic and Paralympic athletes, and those from the Commonwealth, the Queen will say "having discovered abilities they scarcely knew they had, these athletes are now inspiring others". The ParalympicsGB squad returned from Brazil with 147 medals overall, made up of 64 golds, 39 silvers and 44 bronze - their most successful Games since 1988. Team GB athletes also triumphed in Brazil, exceeding their haul from London 2012 by bringing back 67 medals - 27 gold, 23 silver and 17 bronze - in what was their greatest overseas Olympic Games. The address traditionally has a strong religious framework reflecting the Queen's faith, and is written by the Queen reflecting current issues and drawing on her own experiences over the past year. During the last 12 months some momentous events have taken place, most notably the UK voting to leave the European Union, David Cameron resigning as prime minister in the wake of the Brexit vote, and the Queen celebrating her 90th birthday with family, friends and the nation. The speech is one of the rare occasions when she does not turn to the Government for advice but is able to voice her own views. 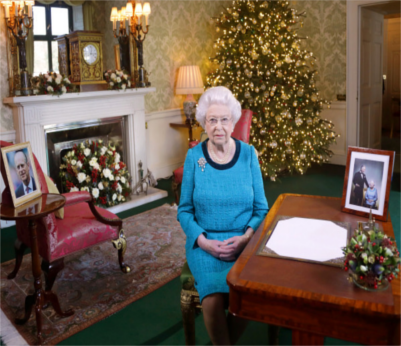 The Queen recorded her Christmas message in Buckingham Palace's regency room while seated at a desk decorated with a floral display and featuring a photograph of her with the Prince of Wales, released earlier this month to mark the end of the Queen's 90th birthday year. It was taken by fashion photographer Nick Knight in May, who captured mother and son in the white drawing room at Windsor Castle before the final night of the Queen's celebrations at the Royal Windsor Horse Show. Another picture can be seen nearby, a portrait of the Duke of Edinburgh. For the broadcast the Queen is wearing a deep jade, silk cloque dress by Angela Kelly, and a pearl and diamond brooch also worn by the Queen Mother. The message will be transmitted on television and radio at 3pm on Christmas Day and was produced this year by ITN.